It’s said that breaking bread together is a good way to get to know the people around you. When it comes to San Francisco’s Excelsior District, breaking green onion pancakes can be equally effective. 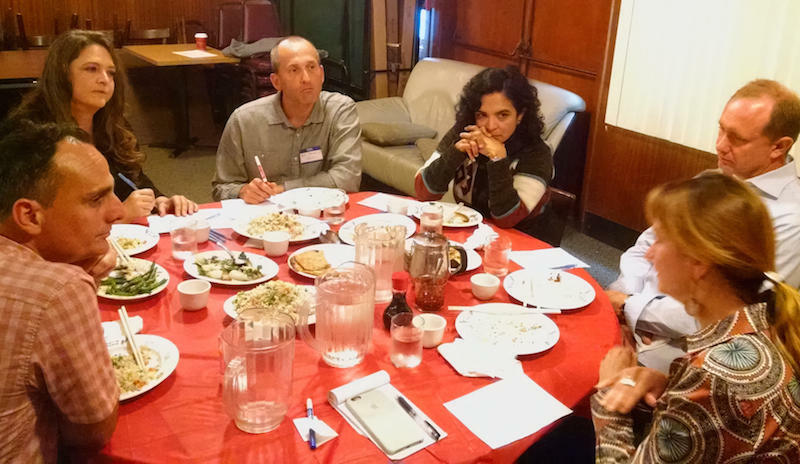 On Wednesday, more than a dozen people who care about the neighborhood came together for lunch at Henry’s Hunan Restaurant — and to talk about how the Bay Area’s housing crisis is affecting their community. The event, called On the Table, was part of a series of community lunches around the Bay Area sponsored by the Silicon Valley Community Foundation. This edition was co-hosted by KALW News, which has its main studios in a public school just outside the Excelsior District, and Renaissance Journalism, which looks to build media collaboratives to reveal social inequities. What makes the Excelsior what it is? Lively discussions took place at two tables over plates of the pancakes, fried rice, shrimp, chicken, and green beans. The first topic was around the unique characteristics of the district. Several participants talked about how the Excelsior has always been a family-oriented neighborhood. There aren’t a lot of high-density apartment buildings; it’s mostly single family homes occupied by people who are aiming to put down roots. It’s also multicultural — historically a neighborhood of Italian immigrants, with more recent waves of migration from Central America, the Philippines, and China, among others, creating a multilayered, multilingual atmosphere. Many residents have long and strong family ties, with multiple generations living together or near to each other. An iconic fixture of the Excelsior street is the grandparent walking the toddler to the park. One neighborhood mom, Rose Medellin, described a group of dozens of people from around the Excelsior whom she takes carolling during the holidays. She sat next to parent and resident Matthew Cahill, who spoke of community theater opportunities in nearby McLaren Park. Joen Madonna, executive director of ArtSpan, talked about her own eviction from her Mission District home and how inspired she was to find a welcoming community in the Excelsior, where she can always count on people from all walks of life passing by her street-level front door. Fellow resident Charlie Sciammas, who works with the environmental justice organization PODER, talked about how neighbors come together at block parties. All described a close-knit community of people from different backgrounds who enjoy recognizing and celebrating each other. Lunch attendees spoke about the Excelsior with much affection, but when it came to discussing concerns, the list was long. Parking in the area is extremely challenging. Public transportation is inefficient. The city is slow to invest in infrastructure, such as improving playgrounds, and that leaves residents feeling neglected. The high cost of housing is forcing public school teachers out of the profession or out of the city. And for a district with one of the city’s highest percentages of kids and elders, a lack of pediatricians and other health services is a problem. It was also pointed out that the Excelsior has a rapidly increasing number of evictions. Ultimately, for a lot of the parents present, the reality of living in a city, and a district, that is becoming increasingly expensive is frustrating and disheartening; they worry that the place where their children grow up will not be affordable for them to stay in when they become adults. Participants talked about policy and program ideas for preserving affordable housing. Those include efforts to repeal and replace Costa-Hawkins, a statewide law that restricts the scope of residential rent control; and work being done by lunch attendee Nick Williams and his colleagues at the San Francisco Community Land Trust, an organization with a small staff and limited funds trying to take on an overwhelming issue. His group pursues initiatives such as minor improvements the city could make to its affordable housing lottery, and connecting people with the San Francisco Housing Accelerator Fund, which works with low- to middle-income households through loans, investments, and direct acquisition of real estate assets. Cathy Meyer, aide to District 11 Supervisor Ahsha Safai, joined others in talking about the power of the city’s Down Payment Assistance Loan Program, which, it turns out, more than one person at the table had utilized. Meyer talked about the myriad issues she sees in the district, and the city, and committed to trying to help solve problems. She did note the difficulty she sees in organizing multilingual districts like the Excelsior, which may have trouble bringing people together around issues, and therefore won’t be able to rally attention they deserve. Sciammas provided a counterpoint by positing the polyglot, multicultural nature of the community provides potential for strength, unity, and pride. Stephanie Cajina, executive director of the Excelsior Action Group spoke about her work preserving small businesses from displacement. There’s no rent control for commercial spaces and most renters are actually on month-to-month leases, so they have no protection from the market. This is making three local businesses located in one building on Persia Avenue vulnerable right now. The Salad Place, Pacita's Bakery, and Los Planes de Renderos Pupuseria recently received notice of substantial monthly rent increases, and at least one will likely be forced to close. Cajina also noted that an unusually large proportion of small businesses in the neighborhood actually own their properties, which is analogous to the unusually large proportion of homeowners in the Excelsior. Both partially explain how the neighborhood has been relatively protected from gentrification. What the Excelsior Action Group is doing to anticipate gentrification is work with commercial tenants to negotiate long-term leases, so they have some contractual security. They also use the city’s legacy business rental subsidy program for qualifying businesses, though Cajina noted that navigating that process is a time-consuming endeavor. A recurring theme in our conversation was the idea that when it comes to gentrification, resistance is a thorny thing. There are benefits that come with gentrification, such as better infrastructure investments, improved safety, rising property values for owners, etc. But until mechanisms are in place to ensure such enhancements won’t entail displacement, there will be tensions around “neighborhood improvement” because of what it might portend. And attendees hope city officials will commit more money and resources to address the housing crisis. What amenities in a neighborhood are desirable for different kinds of people (through lenses of race, ethnicity, generation, class, etc.)? What kinds of "gentrification resistance" actions are effective? Is it possible to make public space improvements for residents who are already in a neighborhood — without attracting the attention of real estate speculation and middle/upper class transplants who wouldn't have considered moving there before those improvements were made? Are there good examples of cities anywhere in the world that San Francisco can learn from, and if so, is it possible to incorporate some of those lessons, or is our system and political culture too different to allow for it? At the conclusion of the lunch, KALW’s journalists committed to exploring these questions. And, ultimately, as attendees pushed their plates aside, they agreed that the conversation should continue. The plan, going forward, is to determine another time and place where more people who care about the community can come together to meet. And, of course, to eat.